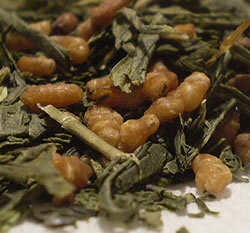 Brown Rice Tea (Genmaicha) is a popular Japanese tea made by combining green tea with toasted brown rice. Brown rice tea is usually made using boiling water and a brewing time of just 30 seconds. The amount listed above is from The Journal of Food Science's lab test of Brown Rice Tea from YamaMOTOYama of America using 2 grams of raw tea. The caffeine content will vary based on amount of tea used and steep time, but generally the caffeine amount in brown rice tea is very low. green tea leaves and toasted brown rice. How Does Brown Rice Tea Compare? Brown Rice Tea contains 0.50 mgs of caffeine per fluid ounce (1.69mg/100 ml).